Megan and Nigel first started talking to each other on Date British Guys in 2015, and now the pair are married and expecting a baby together! We decided to speak to the pair to find out more about their DBG love story. Megan is an American woman who is originally from Pittsburgh, while Nigel is a British gent who lived in Bristol, UK. Before they started talking Megan was very hesitant to try online dating, and she wasn’t sure if DBG was the right website for her. One of Megan’s pictures showed her sitting in a UH-60 Blackhawk helicopter, and Nigel messaged her to ask “is that a Blackhawk you’re in?” As Megan works in aviation she was very happy to find a British man who shared the same interests – and when they started talking Nigel told her that he also flies in the British Army. It all seemed a little too perfect; a handsome British man who worked in the same industry! And so Megan decided to stay on Date British Guys for a few more days, and during that time the pair began to fall for each other. After a week or so the pair decided to start Skyping, although Megan was very nervous about the idea. Thankfully the first chat was a huge success, and the pair ended up staying online for over three hours so that they could keep talking to each other. Soon the love-struck pair were talking for hours every day, so they decided it was time to meet in person. The pair continued to talk while Megan was deployed, providing each other with a source of support and comfort while they couldn’t be together. During this time Nigel was going through a difficult custody battle with his previous partner, and working through the challenges together really brought Megan and Nigel together. Now the pair have an inseparable bond, and soon they decided that marriage was the next step. 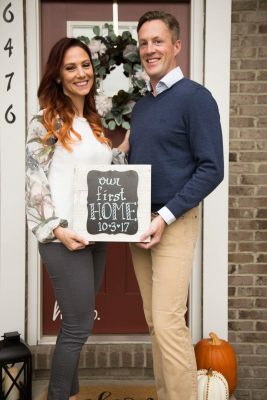 After all, they were already starting to build a house in Pittsburgh where they could live together! So Nigel made the decision to sell his house in the UK, and he started to stay with Megan whenever he wasn’t deployed. The whole team at Date British Guys are so happy to hear that Megan and Nigel found love on our website. We wish their little family all the best for the future!